If you wear removable dentures, then you know that they can sometimes be a hassle. For instance, your dentures may make a clicking sound when you’re eating or talking. Dentures also have a tendency to loosen over time, which can lead to gum irritation. Worst of all, removable dentures have been known to pop out at the most inopportune time. You don’t have to put up with these problems. Did you know that dentures could be attached to dental implants for a more secure anchor? Called an implant-retained denture, this prosthetic offers the beauty of a full denture and the security of dental implants in Marietta, OH. The nice thing about seeing an oral surgeon for your implant-retained dentures is that the entire process happens in one office. From oral surgery to attaching the partial or full denture, you will not have to see any other dental professional. How Many Implants Will I Need? That depends on the type of denture required to restore your smile. A partial denture may only need one dental implant for solid support. On the other hand, a full denture will need at least two implants to remain secure. After a local anesthetic takes effect, one or more dental implants are strategically positioned along your jaw to take best advantage of bone density. The implants are made of titanium, a biocompatible metal that integrates well with human tissue. Healing requires several months, during which time you’ll wear a removable overdenture to protect your gums and give you the ability to smile, eat and speak. Why Does Healing Take So Long? During the months of healing, the implant and surrounding bone fuse together—just like a natural tooth root is bonded to your jawbone. This strong bond is what will eventually hold your denture firmly in place. Furthermore, the implants keep your jaw strong and well formed by stimulating healthy new bone cell growth. This way you avoid bone deterioration, which can lead to unattractive changes in your facial structure. How Are Dentures Attached to the Implants? 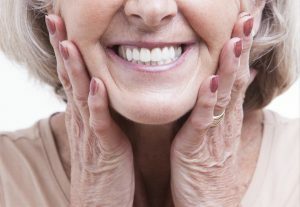 Once you’re completely healed, dentures are simply locked into place. The underside of each denture is outfitted with a metal framework that fits tightly over the implants. With implant-retained dentures, you won’t have to worry about teeth that click, slip or even fall out of your mouth. To learn more about implant-retained dentures and whether or not you are a candidate, contact an implant dentist in Marietta to schedule an appointment. Dr. Jeff Lee is a dental implant dentist and certified oral and maxillofacial surgeon based in Marietta, OH. At his practice, he helps patients with unstable dentures achieve a secure bite using dental implants every single day. If you’re interested in getting implant-retained dentures, he’s ready to help, and you can contact him through his website.